Save boy escape is the new point and click escape free escape games from ajazgames. 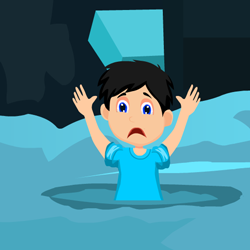 Afternoon was a rainy day and it was so heavy some places water was highly stagnated with water, returning home from school, you see a boy fall into the water log which was deep, he gets stuck, you hurry to save him, to do it you must find clues and solve puzzles. All the best, wish you good luck, have fun playing free online escape games from ajazgames.